From the late 1920s on, Stalin actively encouraged and drummed up adulation of himself by official propaganda. Slavish admiration of the leader was obviously seen by him as an important prerequisite for establishing a direct personal dictatorship. It served to justify Stalin’s absolute prerogatives by extolling his allegedly exceptional, outstanding, and even superhuman qualities as leader. Thank you, Stalin. Thank you because I am joyful. Thank you because I am well . . ..
Thy name is engraven on every factory, every machine, every place on earth, and in the hearts of all men. . . .
Every time I have found myself in his presence I have been subjugated by his strength, his charm, his grandeur. . . . I write books. I am an author. All thanks to thee, O great educator, Stalin. I love a young woman with a renewed love and shall perpetuate myself in my children—all thanks to thee, great educator, Stalin. 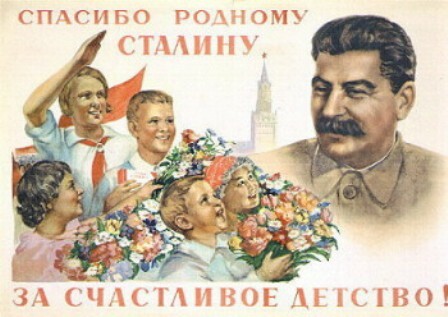 I shall be eternally happy and joyous, all thanks to thee, great educator, Stalin. Everything belongs to thee, chief of our great country. 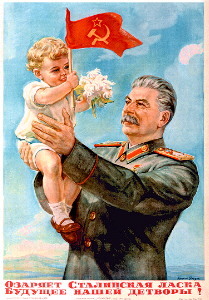 And when the woman I love presents me with a child, the first word it shall utter will be: Stalin. The immoderate fanning of the leader’s cult went hand in hand with massive ideological indoctrination of the populace. The regime sought to turn Marxism into a new socialist religion to serve as an emotional and intellectual substitute of Orthodox Christianity. The Orthodox Church itself was under constant attacks from the officially enforced state atheism, and its role considerably declined. Stalin himself posed as “high priest” of the new atheist church. He shaped Marxism-Leninism into a rigidly dogmatic and authoritarian ideology, designed to regulate all aspects of social life and to serve and justify his policies. His brand of Marxism was characterized by sketchiness and oversimplification, calculated to appeal to the broad masses of the working people. His earlier theological background as a seminarist may account for his ability to find a popular form to express ideas. Catchy and aphoristic slogans, clear and unambiguous ideological definitions, and a knack to present arguments in the form of clear-cut points were hallmarks of his public speeches and written articles. In 1938 Stalin’s Short Course of the History of the Communist Party was published, giving the masses the “authorized” encyclopedia and gospel of the socialist religion. Its author himself was now almost a living god and an object of ritual worship.